After first finding out who else would go with me on this adventure to Borneo (read more about that here), we all were invited to meet up in the Biosphere in Potsdam. That is an inside jungle with over 20 000 plants and many exotic animals. They even have an hourly thunderstorm which really gives you the feeling, you traveled many days to arrive in the rainforest. It’s definitely a very interesting place to take your kids to as well, since they have a lot of educational tours in the Biosphere. So how do you actually prepare for a trip like this? To be honest, you do that more likely at home, than in a city rainforest but meeting up with the people you travel with is of high value. We got to know a bit of each other’s quirks and it was a beautiful team building session for all of us. Constantly followed by a camera, which was still a little weird at the time, we had to complete different tasks is our new jungle environment. Hauling stones from one spot to another and having a wild turtle-chicken-egg hunt through the forest, were two of the activities but then it got really interesting! The producers of this show had a very special surprise for us. They brought in buckets, baskets and cages full of snakes. Neither of us was really scared but of course there was a level of respect that comes naturally during an encounter with a creature that could bite you or wrap yourself around you and cut off your oxygen flow. 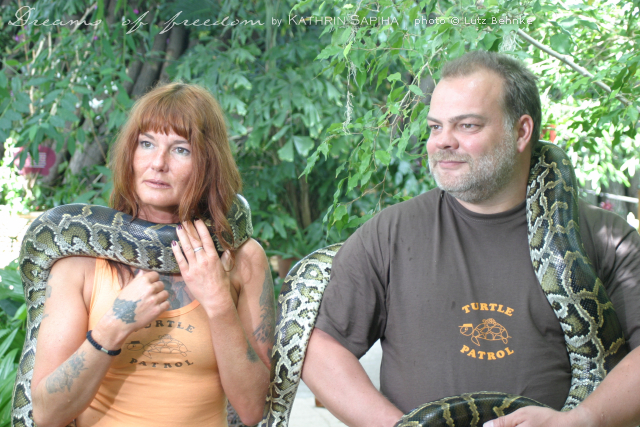 The owner of the majestic animals is Rainer Kwasi, who has been working with snakes for over 20 years and even lives with them in his home. There they are not crammed into cages but they are able to move freely within the whole house. So for him it’s not just a crazy hobby. He lives with these animals and knows the character of every single one of them. 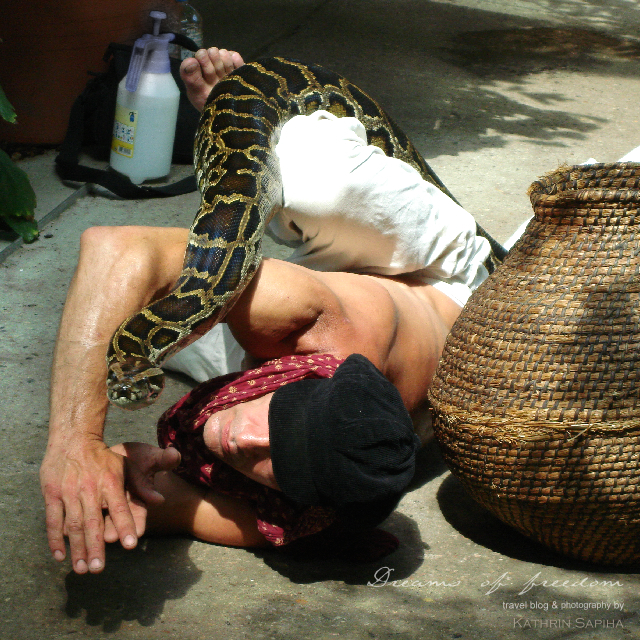 I laid down on a snake and survived it! Rainer explains to me how to carefully get in contact with the python. I made it! Feeling the muscles underneath the pythons skin. At first I must have looked as if I’m trying to learn how to ride a bike, still touching the ground. Not so much out of fear I could fall – it obviously wasn’t high – but because I was afraid to hurt the snake. 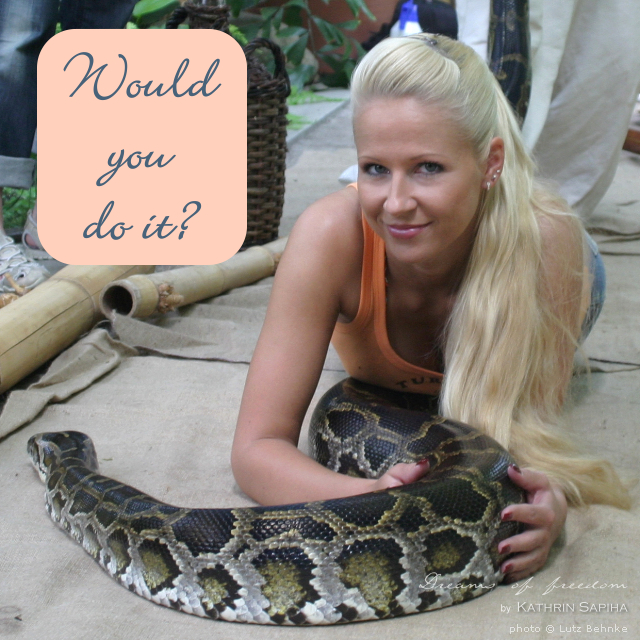 Before you want to eat me alive because I put myself on this poor animal: I promise, the snake did not get hurt! Trust me, I was sceptical too! However I have to tell you that pythons are more muscle than anything and this hercules of a snake really wasn’t bothered by me. Of course after I was “in position” someone had to say something like: “Just because it’s a constrictor snake, that doesn’t mean it wouldn’t bite.” Thank you so much for making me feel even more comfortable! As you know, I survived and all of us had a fun time in the jungle before the jungle. Ok, so how do you really prepare? There were a few items we were told to bring. A waterproof flashlight, a mosquito net, mosquito repellent (which I never use! I always feel like I would smother myself in poison), a rain coat, some snorkeling equipment and other than that, bathing suits and clothes for warm weather. What was ahead of us? At this point, we had no clue. It sounded a lot like a camping adventure so we were pretty much prepared for everything. You may want to check with the Department of Foreign Affairs or the Department of State (the name varies depending on your country). Apart from the regular vaccinations, everyone hopefully has anyway, such as tetanus, diphtheria, pertussis, polio, mumps, measles and rubella (which I didn’t need because I had rubella when I was 12 or so), there are a few that are recommended for Borneo. Hepatitis A and B: If you’re a traveler, you probably got your shot already because it is recommended for many countries. Rabies: I didn’t get that one. And lastly: japanese encephalitis, which I already got for a prior trip to Sri Lanka. There we were: The Turtle Patrol! Officially and on television it was called “The Borneo Project”. Which name do you like better? Not I want to know: Would you try what I did and risk getting near an animal that could crush your bones with it’s muscles? 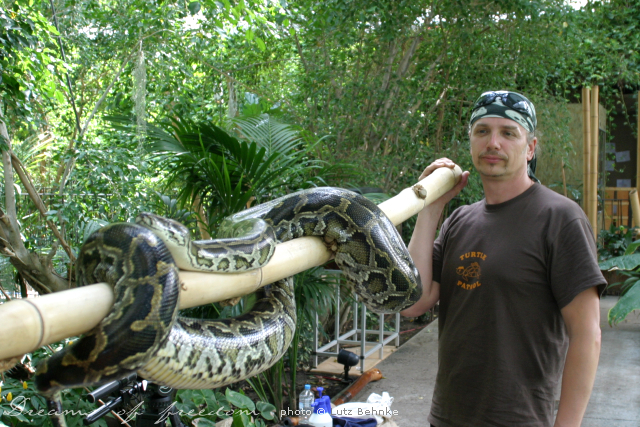 I’ve been told, it would take 8 men to get this python off of me, if it decided to make me his snack. Wow! You are so brave, Kathrin!! The 10th photo looks scary, haha. Wow. never seen anything like that . You seem so calm, not an ounce of fear in you. Thank you for the wonderful blog. I just shiver, frankly speaking really scary. You are really brave girl, i can’t do that.